Caretaker Terry Miller heats the frozen ground in preparation for a winter burial. Today is supposed to be the coldest day this winter. With air temperature near 20 below, it seems like a terrible day for a burial. But there is one scheduled at Calvary. Minnesota is one of several states that requires cemeteries to provide winter burials — if the family requests one. Some families need a prompt burial to help provide closure for grieving. A prompt winter burial also eliminates the need for a second trip in the spring or summer for far-flung family members. Even if there wasn’t a law, the burial would still happen at Calvary. It’s about customer service. “It all comes down to what the family needs,” says Terry Miller, Calvary Caretaker. But a growing trend at Calvary, for cremation burials, is to postpone a winter burial and instead, have a warm weather event that provides a more pleasant family get-together. “Don’t get me wrong. We’re having plenty of burials this winter. But I’m seeing more and more families with cremation burials decide to hold off until the summer, maybe to double up with a family reunion,” says Terry. With cremation burials continuing to increase (now at 55%), the need to hurry with the burial seems less urgent to many families, he said. A hundred years ago, before jackhammers, backhoes and propane ground heaters, it was customary to store bodies in a vault over the winter and wait for the frost to leave the ground. Even now, it takes 24 hours of ground heating to remove the frost for excavation. The Wings of Hope organization will host its next “Evening of Remembrance” at Calvary Cemetery on Tuesday, October 2nd from 6 to 7 p.m.
Wings of Hope is a pregnancy loss memorial in Mankato, MN. It also offers common burial for infant remains miscarried before 20 weeks gestation. For more information about WOH, go to the WOH website. Two fauns browse for food in Calvary’s Resurrection Garden. Caretaker Terry Miller says the deer are pretty but hungry this year. A well-manicured cemetery doesn’t just happen. Calvary’s 40 acres takes a mountain of maintenance, especially during a season of challenging weather. 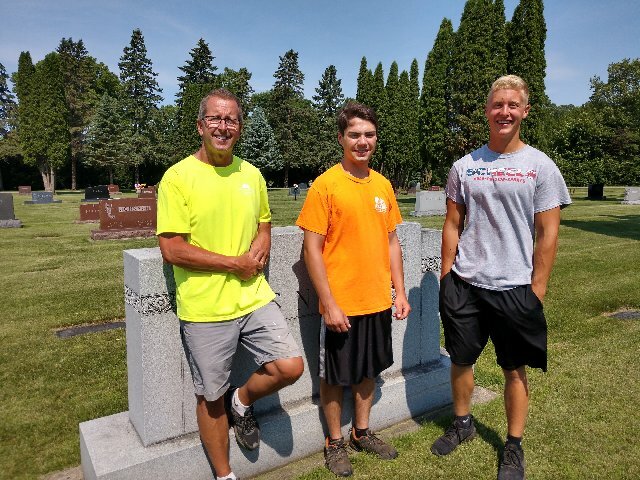 To help Caretaker Terry Miller whack weeds, prune trees, assist visitors, excavate sites and deal with the never-ending cycle of mowing is the Calvary Summer Crew, Hunter Wick and Jake Winch. Jake, on his fifth summer at Calvary, is a student at South Central College, and just graduated from the Auto Body program. He’s in the process of sliding into a full-time spot at the family business, Fromm’s Auto. Hunter is a biomedical student at Minnesota State University – Mankato, and has been on the Summer Crew for four years. Eventually, he’ll be going on to become a doctor or medical researcher. While still young, Hunter and Jake are now seasoned veterans at Calvary and work together with Terry in smooth coordination. Some people have wondered by two young men would want to work in a cemetery. “It’s like a park. There’s a lot of life here with the visitors and the wildlife,” added Hunter. Most of all, the pair enjoy working outside and with Terry, their “favorite boss.” While there is a lot of hard, physical work at Calvary, they work as a team. Terry, they say, isn’t a micromanager; he expects professional results and treats them as valued team members. Hunter and Jake also like Terry’s progressive stance on constant improvement. The two have learned a lot about customer service and running an enterprise. Under his management, they’ve seen the cemetery constantly improve with new sections, a new watering service (done by Hunter) and new efficiencies with better equipment. “He’s like an entrepreneur. It’s like it’s his business,” said Hunter about Terry’s constant push for improvement. Terry says he’s been blessed with great help over the last 25 years, and that Jake and Hunter are no exceptions. “What I tell everyone is that a man is only as good as his tools…and help,” said Terry. Terry says he strives to develop teamwork and coordination with his crews. The Calvary Crew has been battling with the elements, specifically the “copious” amounts of rain and mist that has been drenching the Mankato area over the last 10 days. The grass has been growing at a record rate…and so have the weeds. So Terry, Hunter and Jake have been hard at it. Mary Zellmer decorated a gravesite in preparation for Memorial Day. This year’s Mass led by Fr. Kunz drew about 400 people despite some really hot weather. A whirlwind of preparation is happening at Calvary Cemetery right now for its biggest event of the year: Memorial Day. “Typically, we have more people visit the cemetery on Memorial Day than all the other days of the year combined,” said Terry Miller, Calvary Caretaker. A special Memorial Day Mass will be held at 8:45 a.m. on Monday, May 28th. Father John Kunz of St. John the Baptist Catholic Church will be the celebrant. “In the past, we’ve had anywhere from 100 to 700 people attending. It really depends on the weather,” said Terry. While the Mass is said within Calvary Chapel, many of the visitors sit outside on lawn chairs and hear the service through the P.A. system. Immediately following Mass, American Legion Post 11 will conduct a ceremony at the veterans’ memorial on the east side of the chapel. Park on Goodyear Avenue in front the cemetery and walk in to avoid being blocked in the cemetery. Bring lawn chairs in case you cannot get a seat inside the chapel. Dress appropriately for the weather that morning. No glass containers are allowed — please anchor flowers well or the wind will take them. This week’s recent snowfall, if it sticks around, will help give Calvary a White Christmas. 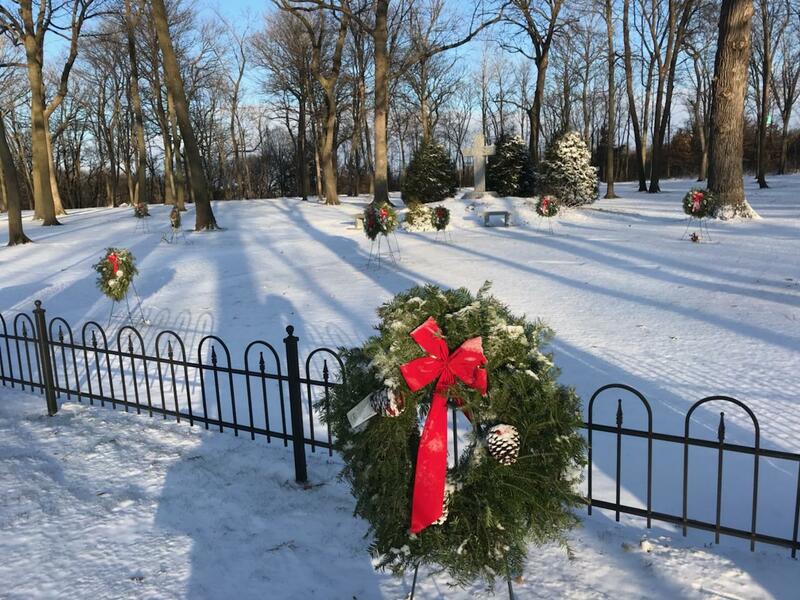 It certainly gave the cemetery a holiday backdrop for the recently-installed wreaths. “What a difference a day makes,” commented Terry Miller, Caretaker. Each year, the cemetery gives families the opportunity to buy wreaths to decorate their loved one’s burial site. This year, about 250 wreaths were installed around the cemetery. The recent snow completed the holiday theme. Terry would like to thank all those who placed holiday orders this year!